Watch here for 2017 dates. Each sound bath features 19 Alchemy™ crystal singing bowls, plus a special bowl set with specific healing properties based on the needs of participants. Limited to 10 guests each session. Advance purchase recommended. 2) Send an e-transfer to admin@nancywatters.com, with a note about which session(s) you want. Treat yourself to sonic journeys that deliver a new generation of quantum wellness. These soul-nourishing sounds drop you into alpha brain waves and deep relaxation more rapidly, powerfully and profoundly than years of meditation. Come de-stress deeply and connect with your Divine Essence. 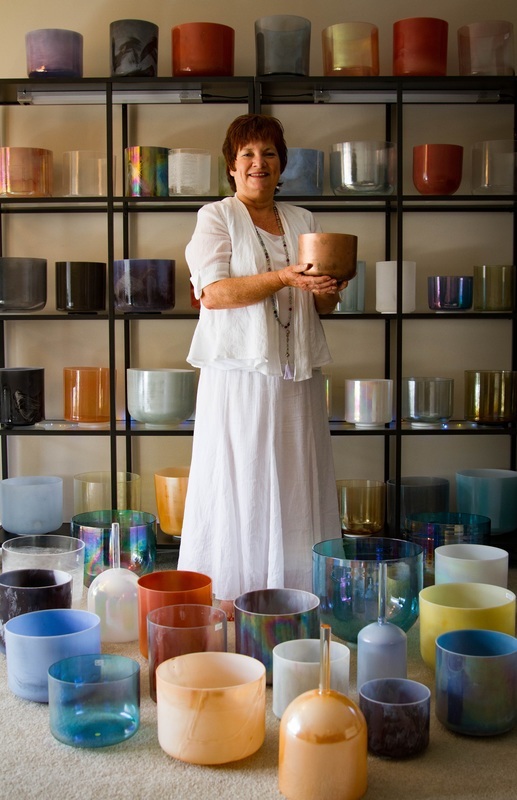 Using ancient sound healing techniques and modern mind-body medicine, Nancy Watters weaves spellbinding soundscapes with Alchemy™ quartz crystal singing bowls, overtone singing and world chant. The unique Alchemy™ crystal singing bowls are created with a patented fusion technology that delivers particularly pure vibrations. Their sounds convey the energetic properties of quartz crystal fused with gems and minerals such as Aqua Aura Gold, Sedona Red Rock, Tibetan Quartz, Celestite/Morganite, Azeztulite, Turquoise, Lemurian Seed, Platinum, Sunstone, Chrysoprase, Kyanite, Kunzite, Emerald and more.